“We are one Fermilab” posters are placed in many meeting rooms across the Fermilab site. To do the best science and develop breakthrough technologies, Fermilab needs a great mix of people who are welcomed and feel empowered to contribute. Thus, Fermilab is committed to cultivating an inclusive work environment that attracts, develops and retains diverse talent. With the input from people across the laboratory and its user community, Fermilab developed a statement of community standards, which was adopted as a Fermilab policy on July 18, 2017. 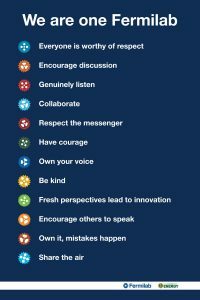 It establishes and communicates the set of expectations that all members of the Fermilab community shall follow and applies to employees, users, subcontractors, visitors, and guests. All members of the Fermilab community are responsible for reporting violations of applicable policies, ethical standards, contractual requirements or laws. You are encouraged to raise concerns about any violation of this Statement of Community Standards. Confidentiality shall be maintained and reporting should proceed without fear of harassment or retribution. Contact your human resource partner, or report via the confidential Fermilab Action Line at +1-630-840-4000. Or just stop by to see Tim or Joe! Fermilab leadership is committed to addressing all incidents promptly and thoroughly. Violations can result in disciplinary action up to and/or including termination of employment, contract and/or site-access privileges. Our work environment connects each employee to the lab by promoting collaboration, flexibility, and fairness. 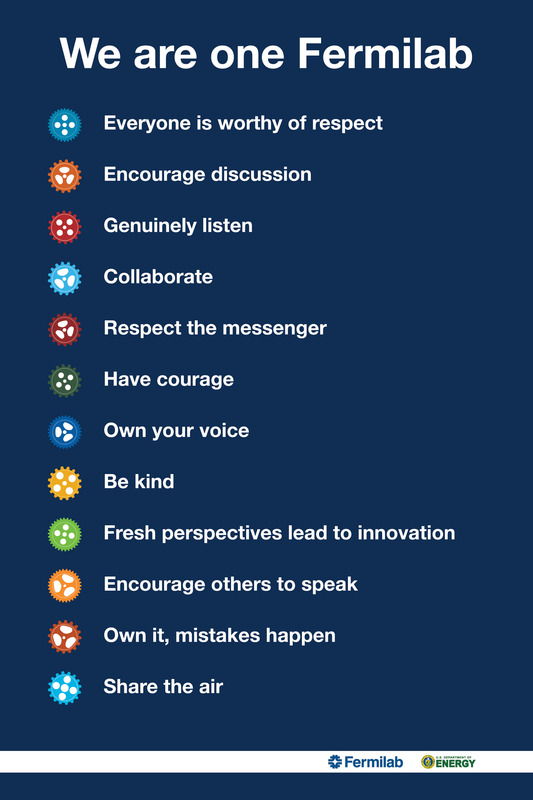 “We are one Fermilab” posters placed in meeting rooms around the lab reflect these values. We know we have a long way to go, and we continually strive to ensure the talents, contributions and identities of all employees are respected and valued. You can learn more about the many Laboratory Resource Groups, which aid in sharing knowledge and assuring equity and inclusion for each member of the lab community, on the lab’s Diversity and Inclusion website. Sandra Charles (Talent Acquisition, Diversity and Inclusion Manager) and we welcome your thoughts on ways we can continue to support our employees.